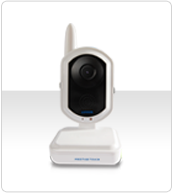 Separate camera for the Luvion Prestige Touch baby video monitor. Please note that this camera only functions correctly with the Prestige Touch and is not suitable for use with other models. 3. Unique for the Prestige Touch is that you can watch 4 different cameras simultaneously on the big 7 inch color screen.